I never got to use the sand-cast foundry in my high school’s Industrial Arts shop. Something was wrong with it, as I recall, so we could only talk about how it works, but that foundry came to mind when I read the opening words of Hebrews. In sand casting, a pattern is pressed into a frame of compacted sand to create a mold. After removing the pattern, molten metal is poured into the mold. 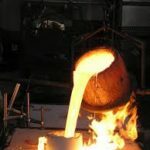 When the metal has cooled, the mold is removed from the completed casting, rough edges are smoothed off, and any other finishing work is done. All told, the process is extremely detailed, requires intense heat and pressure, and can develop imperfections at any point. Kind of like being a disciple of Jesus. I used to think Jesus was the pattern a disciple was supposed to follow. I don’t think that’s wrong, necessarily—Paul suggests it in Romans 8—but when I read these words in Hebrews recently, I had to do some new thinking. Hebrews says Jesus is “the exact image of [God’s] nature.” In a sand-casting analogy, that suggests that God himself is the pattern and Jesus is the mold – the sand that’s pressed around the pattern. We are metal that gets melted down, both to be refined (see Zechariah 13:9 and Malachi 3:2), and so that we can be poured into the mold. Melting is hot and hurts, but it’s the only way to get rid of the impurities in the metal. Even after we’ve cooled down and been removed from the mold, there’s still work to do. Scrap metal must be cut, chiseled, hammered, or torched off. Rough edges need to be filed down. It’s a lifelong task. Where are you in the process? This entry was posted in disciple and tagged fire, foundry, Hebrews, refine, Romans, Romans 8, sanctification on July 13, 2017 by Randy Ehle.